New at 24/7 MOMS - Each Tuesday we will feature "How Technology can simplify your Mom World" We will share our Tips, Resources, and Product finds that we have discovered. If you have a Techno idea or product that has simplified your mom world- email us at trisha@247moms.com. How many days ago did I change those batteries? How many days ago did I open that can? I often find myself wondering this and sometime smelling food to see if it is still "ok" to eat. Yes I know kind of gross! Well here is the solution to my problems and the last of smelling food too! 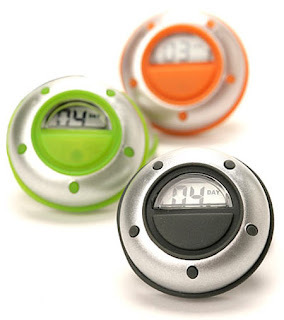 The DaysAgo digital daytimer answers the question, "How many days ago did I ...?" You can fill in the blank with anything from change the smoke-detector batteries to water the plants to feed the fish. How many days ago did I open that jar of baby food? How many days ago did I put those leftovers in the fridge? How many days ago did I get that fruit? By keeping track of food's freshness, we waste less, use more, and spend less money replacing what went bad. The DaysAgo is small, inexpensive, and adaptable. The gadget attaches to items by suction, band, or magnet, so you can use it anywhere and for anything. A simple touch of the button starts the counting. 2. If you are already a subscriber just leave a comment that you are a subscriber.US entries only and one entry per person. Winner will be chosen on August 9, 2009. I'm a subscriber and these sound like a great idea! I already subscribe! Love this idea! That is so cool! I am already a subscriber. I'm a subscriber. Thanks for another great giveaway. What a smart idea! I'm a subscriber...thanks! That is so cool......I am so bad about that! I'm a suscriber! These are such a great idea! I love them! Thanks for the chance to win one! This would be very useful! I am a subscriber. I'm a subscriber and this digital daytimer is a great idea! Thanks! I subscribe at jill and mike2 at yahoo, thanks! Are You a Shouting Mom? Bloggy Giveaway - WIN Geo Mate Jr.